Is it possible to mount the heatsink so that the fan moves the air towards the top of the case rather than towards the rear of the case as displayed in the review? It's possible, but in that position the cooler moves the hot air from video card. Look at the picture. Why always temperature rise up tu 52C when I'm playing a game (never above)? - my CPU is only 45~% stressed in that game. 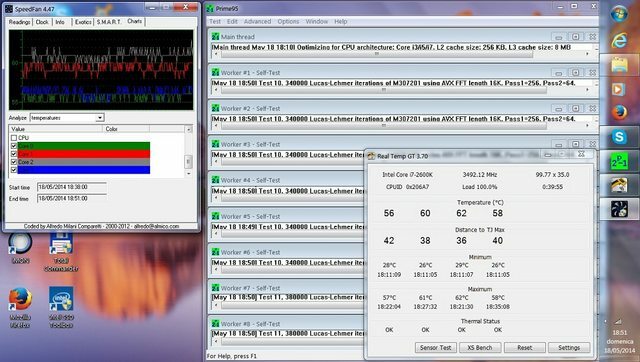 It may be possible, but it's far from certain: with a GTX 660 and the cooler oriented towards the top grille, my CPU temp was actually lower. So probably the mileage may vary. I don't know how the short Macho may help you (even if it's a good cooler with an horrible fan, indeed), but anyway in my experience with Nehalem usually half a load won't mean half the CPU temp. 50 does seem pretty unremarkable, but I wouldn't swap a cooler over it. If your setup fails a stress test, then that would be a good reason to swap, and a clear indication something is actually wrong. 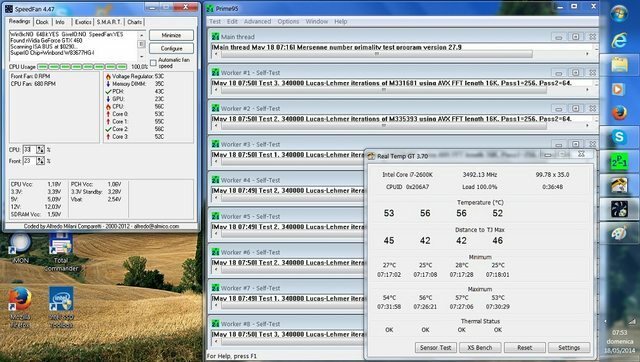 I take it the HWMonitor view means you've tested with all fans turned up to full RPM? Just in case it's a circulation issue and not the cooler's capacity to dissipate heat. Another test for circulation is running with the side panel open. Indeed. It's hard to tell which is the most efficient way for the airflow in a case without testing, especially when there are 6-7(!?) fans fighting over the same air path. Speaking of paths, did you use two exhausts with the cooler exhausting upwards? I'm just thinking the cooler may have been pulling air from the rear exhaust if not. Is your bottom fan outake? I guess the hurricanes-fighting metaphor was more apt than I first thought. Also, that's two slots the R4 has at the top, right? If the other one is unoccupied (it looks like light is coming through it), you've got a short-circuit there. I don't understand what you said. What is R4?! Where I have short electric circuit? My bad, I remembered you had the R4; it's a different case apparently, with largely similar fans even. If you have an empty fan slot (or any hole really) next to an active fan, that fan will draw air from that hole next to it instead of the intended target, creating a 'short-circuit' of sorts. This reduces pressure and may cut off parts of the setup from proper circulation. Also, your bottom fan is not an intake. It's on the wrong way around (air comes out the strut side, not the hub side ). The bottom fan is exhaust Now I'm feeling very bad. The free fan slot is not "naked". I've putted some duct tape one it. Next days, I'll fix the bottom fan, but not sure what to do with the rear one? Should I put it in top? And try to mount the cooler to move the air towards the top of the case? Hah, no sweat. Abula's eyes were the sharpest in this case... I didn't notice the fan at all (and later didn't realise it was not the R4 I was looking at, geez). Plugging up holes is a good idea, less holes means less dust entry points and more airflow where it's supposed to happen. I think the rear exhaust fan is fine where it is, it helps the CPU cooler and the motherboard's VRMs. 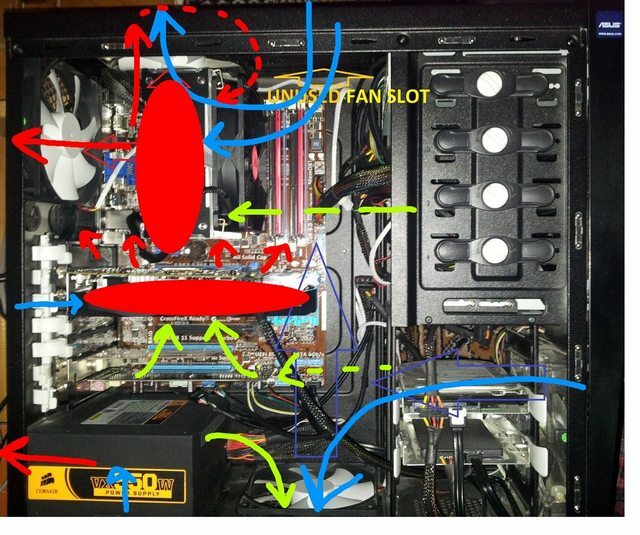 If anything, I would strip the top fan and leave the cooler and rear fan to do the ol' push-pull setup. There really isn't a need for that powerful an exhaust in your system, and the top hole is very vulnerable to dust, small items, liquids etc. I would only use a top if I had ducted the rear exhaust to the CPU cooler. As an amusing side note, I spilled a drink in my last rig through the top hole... never using a top fan ever again. Also, I leave the bottom slot unoccupied, since it gets so dusty down there and I haven't noticed an improvement in temperatures with a bottom fan - I guess it's more for multi-card setups (SLI or CF). 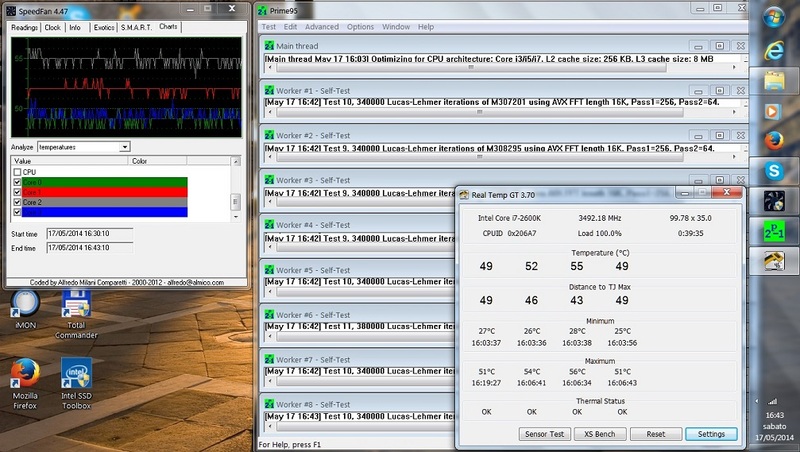 Here is a test where it's used different positions for tower CPU cooler. The result is really surprising. http://www.hardwaresecrets.com/article/ ... ler/1815/4 (I don't want to make any advertising). Seeing as the case has a gaping hole instead of a top panel, I wouldn't call it exactly surprising. If anything, the few degrees' difference might be explained by reduced back pressure (= better flow through the sink; the AR01 cooler they used has tight-ish fin spacing) and better ventilation (less hot air standing still, as everything goes out). Even suggesting that natural convection - a very weak, very slow process in air - would be the cause is laughable when active cooling and ample ventilation are in question. The heatpipe orientation myth was debunked long ago, but it's good that they made note of it. What's not so good is their atypical setup: top panel practically missing, half-length video card not restricting cooler and no exhaust fans. The last part especially could turn this on its head, if there was a rear fan evacuating the hot exhaust as effectively as a gaping hole would. I wouldn't draw any applicable general conclusions (let alone recommendations) from this, except maybe that 'airflow is good for cooling'. With all its flaws, this is still a good reminder of how important testing is when it comes to figuring out YOUR case's cooling. It is good to challenge the established formulae and experiment, but one should be mindful of Why and How. Thank you very much, for you explanation, I appreciate it! I will do some experiment when I will have more free time. I think that if I will make a direct circulation of air, with one fan on bottom(intake) and one on top(exhaust), positioned face to face, it will do some difference. And I almost forgot to mention that summer is very hot in my place. I am really surprised by your findings, Lawrence. Anyway, just for pleasure I will test it again on a Core i7 2600K against the Thermalright Archon SB-E X2, and I'm very curious to see what will happen. Looking forward to those field tests! So, back in black: pardon, in topic. As said, it's just a quick'n'dirty field trial, I did not use any precautions to make these tests as repeatable (actually I was doing other things, so basicly I just swapped the coolers when necessary): first of all, I forgot to use HWiNFO to log the data (my bad), I just took the highest temp measured after a while (usually around 30 minutes, even if I forgot to stop the test in a couple of times), after looking at whether the core temps are stabilized or not. I would attach to this post the relevant screenshots, but while the max allowed attachments are three, the relevant .jpg are eight: so, any advice for a reliable and free image hosting service is welcome. 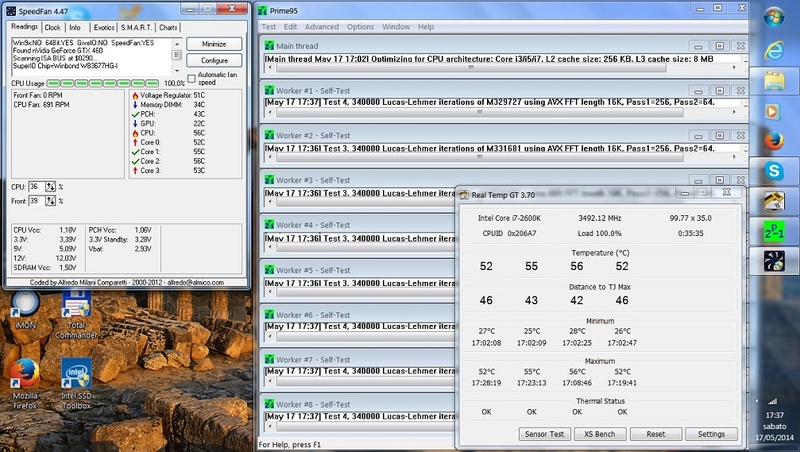 The test bed was an Intel DP67BG board fitted with a Core i7 2600K: it has been loaded with eight threads of Prime95 27.9 Build 1 64 bit Small-FFT, stock clock, stock voltage, "fixed" fan speed (around 680rpm, or if you may rather, something in between from 659 to 691rpm), while the reference fan was the Kotetsu one, the Scythe SY1225HB12SM-P. Whether you may need any further explanation, just ask: I will be glad to help, if I will be able. Last edited by quest_for_silence on Mon May 19, 2014 8:12 am, edited 1 time in total. Looks good Luka, thanks, even if we don't have the data plots. Good to be back on the actual topic, too. I recommend Imgur for your image hosting needs. Very lax limits (I haven't run into any), free, reliable as all hell, easy to link to BBCode forums like these here. Thanks, Luca. Please upload to SPCR rather than using a hosting service - we've lost a lot of images in older posts because the member's hosting account went away. You should be able to upload more than three images in a post. It's what I tried at first, Steve, but unless you changed my settings the board refuses to attach more than three. Please let me know whether this thing changed, as I'd put the relevant images on SPCR. It's above my pay grade. Various later versions of the Ninja moved away from 2,3&4, and got worse with each iteration. Press fit heat pipes were a disaster. Seems the Kotetsu is reaching the US market. Seems the retailer is trying to take the advantage of being the only reseller atm and jacking up the price to absurd levels. Hopes Scythe USA, bring some soon and sells them as they are doing with most of the current heatsinks furfill by amazon. Talked about a coming build today, checked Kotetsu availability. Locally available, prices start at 32 euros. Limited retail stock, but importer seems to have plenty. It looks like Outlet PC is now selling at a much more reasonable price through Amazon. It's the same link as provided by Abula. well thats a lot better than newegg business has them for, but they do include free shipping! Thanks Steve, that was the store I was remembering. It is slightly higher than MSRP, but it is still quite reasonable, and it is an effective cooler. Although I don't use the LGA 2011 platform with RAM on both sides of the CPU, I was considering splurging on a Noctua NH-U14S; to the extent that they help me find a balance between CPU temps and other temps, I value CPU heatsinks that minimize obstruction of front-to-back airflow (in the future, I'd like to experiment more with top-downers for this reason). I'm amazed that the Kotetsu bests the NH-U14S, despite being 20 mm shorter parallel to I/O shield, using a 120mm fan instead of a 140mm fan, and weighing only 2/3 as much. The NH-U14S is $65 shipped from trusted sources, compared to $53 shipped for the Kotetsu to the US East Coast from Frozencpu, who I've ordered from many times. As reported, I'm also seeing it from OutletPC for $47 shipped, although I've never ordered from them before. I haven't needed to buy a flagship, 'premium' cooler since the days of the Thermalright SLKs, and with the arrival of the Kotetsu, this trend looks to continue if the results are similar for my configuration. Looking to the future, my only concern would be the Kotetsu's ability to handle quietly overclocking my 4770K, once it starts showing its age and gets delidded. I sometimes OC my CPUs once they get long in the tooth, if I can keep the noise down to acceptable levels. I asked Scythe US about Canadian availability. Good news is they're currently working on it. The 3 US sources that currently sell it have already been mentioned in this thread. some one ought to ask scythe if they plan on taking sales accounts away from the seller(s) that is price gouging? The company linked above is now pricing them at $40 USD, shipping included. This is close to the MSRP from Scythe (indeed, this will be cheaper, ultimately, than MSRP + typical paid shipping), so I went ahead and ordered one.